Presented on the occasion of the 100th anniversary of Remington’s death, this exhibition celebrates the fascinating life and work of an American master. A century ago, Frederic Remington (1861-1909) was the busiest artist in America, having first made a name for himself as an illustrator of western and military subjects for widely circulated magazines of the late 1800s, such as Harper’s Weekly, Scribner’s, and Collier’s. Overcoming the limitations of black and white illustration, Remington taught himself color theory and investigated the science of bronze casting to become an accomplished painter and sculptor. Through dynamic depictions of cowboys, horses, frontier cavalry soldiers, and American Indian warriors, Remington captured the romance of the then-fading American West. He researched his subjects firsthand in the field, in books, and through correspondence, imbuing his work with a journalist’s sensibility for storytelling and a palpable sense of place. When Remington died at the young age of 48, he had produced over 3,000 signed paintings and drawings, 22 bronze sculpture compositions, one novel, one Broadway play, and over 100 published articles and stories. More than any other artist, Remington created our most enduring images of the West, giving Americans their vision of the frontier and inspiring a new genre for the film industry. Known for his expressive realism, Remington created vibrant scenes filled with incredible detail. He knew the West of wild riders and vacant land would soon vanish, so he aimed to capture its every nuance. Remington sought out the romantic, often depicting imaginary scenes imbued with an aura of truth. His talent for storytelling helped him excel as an illustrator. He remarked, “I draw what I know, and I know what I draw.” The artist traveled west extensively, made sketches, took photographs, and recorded accounts in his journals, then returned home to New York to create finished works in the studio. He sold his illustrations to popular magazines of the period, whose readers were hungry for tales of western adventure. In works that explored such universal themes as the struggle of the individual against overwhelming forces, Remington became the country’s leading interpreter of the West. Drawn from the exceptional collections of the Frederic Remington Art Museum in Ogdensburg, New York, this exhibition of twenty-six original paintings, drawings, and sculptures showcases the breadth of Remington’s career. Buffalo Hunter Spitting a Bullet into a Gun illustrates Remington’s ability to capture the spirit and energy of the Old West. A hunter in full-speed pursuit of a buffalo prepares for a second shot by loading the gun with his mouth, rather than a ramrod, which would require dismounting. Another highlight is Lieutenant Casey, Commandant of Cheyenne Scouts, an equestrian portrait of a cavalry officer Remington greatly admired. Remington rode with Casey just months before the lieutenant was mortally shot and was deeply impressed by Casey’s diplomacy in dealing with the Sioux. He wrote about Casey in two Harper’s Weekly articles and considered him an American hero. While working as an illustrator, Remington honed his skills as a fine artist. 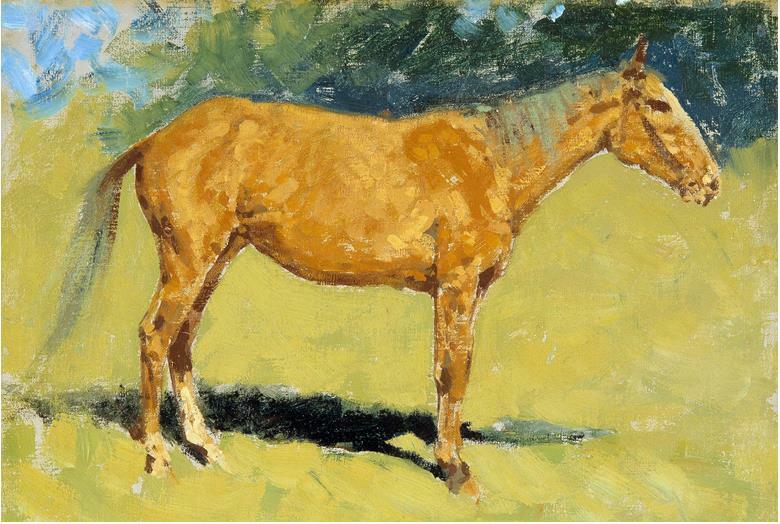 A series of five horse studies—including a painting of his own horse—demonstrate the artist’s continual exploration of different stylistic techniques. One of Remington’s exquisite “nocturnes,” or scenes set at night, is also featured in the exhibition. Untitled (or The Cigarette) was identified by Remington’s widow as the last painting he was working on before his untimely death. Night color was of great interest to Remington, and the subdued palette and quiet mood of this campfire scene allude to the vanishing western frontier. Today Remington is perhaps best known for his bronze sculptures, four of which are showcased in the exhibition. He turned to bronze casting in the 1890s to capture in an enduring, three-dimensional medium the energy and motion of the horse. 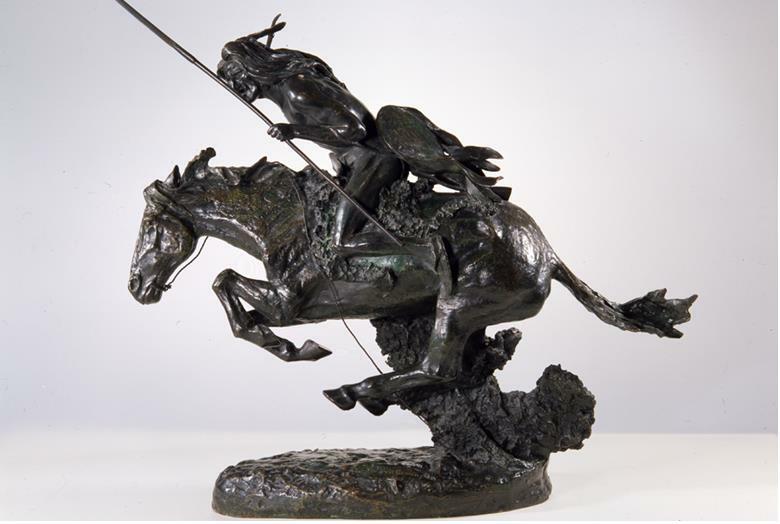 Remington’s first sculpture, The Broncho Buster, portrays the dramatic action of a cowboy struggling to control a bucking horse. Without relying on a central column for support, the sculpture’s cantilevered design is an outstanding example of Remington’s mastery of an incredibly difficult medium. This exhibition is generously sponsored by media partners Castle-Pierce Printing, Cumulus Broadcasting and Time Warner Cable.